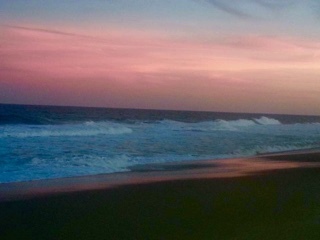 I just enjoyed an overnight at the beach. Seemed like bad timing with all the stress and loss over the month, but it had been planned long ago and I was determined to keep the outing. The twins had a day off of school on Wednesday followed by our oldest having a rare day off from her internship Friday due to the Popes visit to Philly. We are blessed by friendship with a family who shared their home at the beach which I made "home base" while I taxied the kiddos back and forth. I did attempt to stay "down the shore" in the middle so a friend could join me to take a deep breath but it didn't come together. We will need to find another opportunity to smash things. You see, ever since the news that her daughter in law had passed away I've just desired to smash something...anything! And as the month brought more and more stress and grief to us the desire just stuck around. My plan was for she and I to take on the shoreline at Long Beach Island and just stomp on any shell looking even partially whole. Just imagine the satisfying crunch that could make. Shoes on, of course. We would've crushed until our hearts felt more whole in comparison to all those broken pieces. That was the plan. Wednesday went well and our friends thrilled the twins with a fabulous final boat ride on the first day of autumn. We arrived back home tired but satisfied. Thursday I paced around waiting for word that I could meet my daughter at a train station enroute to the New Jersey turnpike. Once the text came I delighted in meeting her amidst all the hubbub of city commuters and headed off. Good thing we had that beautiful drive, dinner, and sunset because Friday dawned downright windy..."tear a kite from its strings" windy. Like I mentioned, this day was planned months in advance and we were determined that this day on the beach was to become a reality. Gathering up our blanket, books, and towels we trudged down to the seaside, mildly disagreeing on the spot to set up camp. We settled on a middle ground, she trying to avoid the extra chill from the ocean waves and I trying to minimize the sting from the wind blown sand. In the end it didn't matter. We tried huddling on our blanket while the winds whipped and pelted the fine sand into every exposed piece of skin. I tried to distract myself with my husband's books I had snuck into my bag only to cause the seems of every page to become encrusted with sand and to watch the page of notes he used as his bookmark go flying down the coast at lightening speed. So much for being sneaky. (Please God, don't let those notes be anything he hoped to look at again!) After repositioning a millionth time, I finally remembered that repeating the same process produces the same result and decided to jump up and take a walk down the beach instead. "...Then a great and powerful wind tore the mountains apart and shattered the rocks before the Lord, but the Lord was not in the wind. After the wind there was an earthquake, but the Lord was not in the earthquake. 12 After the earthquake came a fire, but the Lord was not in the fire. And after the fire came a gentle whisper. 13 When Elijah heard it, he pulled his cloak over his face and went out and stood at the mouth of the cave. After a month of "freaking out" on the inside following two deaths, beginning to clean out my mom's home, fighting insurance over wheelchairs, seeking help from state reps and congressmen, fighting to get to settlement to adapt and modify a one story home, having a car totaled, a school aid hurt badly in an accident, and a daughter sick in Rwanda I finally took a step away from the noise and heard that still small voice. As I wished for a brown lunch bag to hold my handful of sand dollars I wondered at God sending me this joy just for my pleasure, that His creation is so intricate, and He is the maker of all. I studied the little shells again, trying not to crush them, marveling that they were so incredibly fragile and yet lay here next to the raging Jersey shoreline with winds whipping up sand. Fragile and resilient. Just like us. And I thanked Him for bringing me this joy. 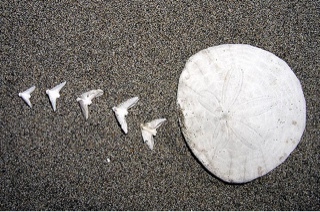 I could've been content looking for shells and finding some of the snail-like shaped ones and the glittering coin shaped thingys (why yes, those ARE their scientific names) but He sent me sand dollars when I expected nothing except clam shells to stomp on. 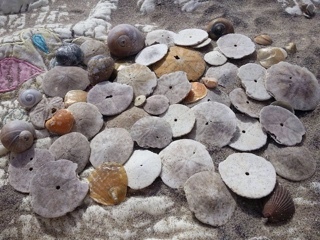 As I made my way back to my blanket trying not to spill my cache I had another thought: while I had been concentrating so thoroughly on finding those sand dollar treasures I no longer felt the sting of the sand on my skin. The wind hadn't stopped, but my focus had changed. I knew what God was saying... I need to keep seeking Him despite the storms. I'd like to say I returned home fresh and rejuvenated, but that just isn't where I am on this journey. When I needed to duct tape a wheelchair Sunday morning while AAA repaired my flat tire I felt the stinging sand in my soul. But God is good...all the time. We still made it to church in time for the second service and I chose to sit in a different spot to pout about my morning. How unexpected, and yet not, when our pastor had us turn to 1 Kings 19 for our passage...the same book and chapter of the verses God had given me on the beach. I didn't know the context of the verses about God sometimes speaking in a roaring wind and sometimes a still small voice, but as our pastor announced his theme as "not letting our circumstances define God's love for us, but rather letting God's love define our circumstances" I knew I was about to find out. God didn't disappoint! "He came to a broom bush, sat down under it and prayed that he might die. “I have had enough, Lord,” he said." See! And besides, edamame is packed with fiber, protein and vitamins. I should be set for today! I was a little distressed, however, that just three days after joyfully scooping up a bowlful of treats in my private little sand dollar "scramble" I could become so easily thrown by the winds again. But that is how I am...fragile and resilient. Distracted and refocused. Discouraged and encouraged. Do you know what my favorite part of those candy scrambles from years ago had been? It was when the kids would come back with their bags and offer up a favorite candy to share with us. It struck me so funny since we were the purchasers of the candy and had we really wanted a special candy we could've kept it. After all, they had belonged to us before we signaled the beginning of the search. But the candy became that much sweeter when offered back to us, especially when the offering was the best chocolate or rare caramel cream and not just a peppermint. I don't know about you, but I'm feeling a bit trampled in the search these days. I want to be grateful and freely give back my best. I want to keep my focus on Him, His goodness...even in the storms, especially the storms, knowing that focusing on Him can minimize the sting and give me a fresh perspective. I want to let God's love define my circumstances.